I was in a crunch, spent too much time with dishes, laundry and the little studs and lost track of time. I knew I had to get in 8 miles before meeting Amanda at 10AM. So I set out for sub 8 minute mile pace. My legs felt fresh, strong, fast. There were several people getting ready for a Bike rider but not many on the trail. CUTE= Mom running while holding her roller-blading daughter's hand!! My bondiband was making me HOT, I wanted a hat or visor, I thought I might have enough time to shop at the little sports store, but doubted that the $10 in my fuel belt would get me anything. As I approached the park I looked up and there was Amanda in her Jeep, PERFECT timing!! I have MISSED Amanda! 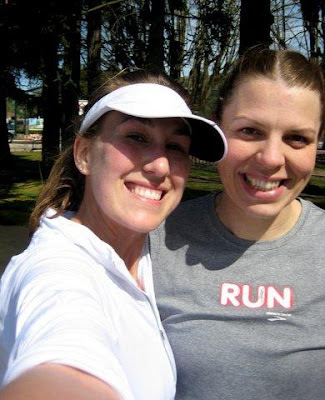 I would run with her weekly if it worked out.. We met on 10/10/09 read about our First Running Date HERE...hmmmm Amanda we should run Portland to celebrate on 10/10/10?? I wanted to see her before she left for her FIRST MARATHON next weekend.. I had a signed copy of "Run Like a Mother" to give to her and a HUGE HUG of course. There is never a shortage of conversation. I am in AWE of her strength raising a son with her husband away. The Marathon to her is something so different, I wish that I could see her face once she crosses that line. I am sure the PRIDE will be similar to her recent Half Marathon PR. Along the way we avoided Horse poop, and walkers. The CRAZIEST thing we saw was a man on an over sized unicycle, I said "That is the craziest thing I have seen today" and he replied "Hey Now!" Oops, did not mean to offend. But just 25 yard behind was a hairy dude on a 9-10 foot TALL bike, I think it was a tie for CRAZIEST! Who knows how he gets on the bike?? I was in dress rehearsal mode with clothes, socks, water belt/hand held and fuel. All worked well and I THINK I have it down. Amanda was suffering from a Sun induced rash and was not feeling well, she TOUGHED it out. We cruised to the finish and I quickly crabbed my chocolate milk from my cooler in the car....I LOVE LOVE LOVE cold Chocolate milk after a long run and will have Muscle Man poised at the Eugene Finish with my Chocolate Milk!! Thank you Amanda!! You will be AMAZING in your first Marathon...text me when you are done, I will be tracking you. Check out her post HERE.. So what did I use my $10 in my fule belt on??? $5 on a Smoothie. YUMMERS!! I'm a big fan of chocolate milk post-run too! sounds like a great/interesting day! You are SO ready for the marathon! So excited for Zoe! Count me in on that baby shower! Okay girlie...that shirt is too cute! I am sooo excited for Zoe. Count me in to help in the virtual shower if you need it. You make my routine runs sound so boring. I am going to need to find something more interesting to run by...oh yeah, we have loads of cow manure but that's not really exciting! Glad you and Amanda got to run together. so many fun running adventures with friends! you should be so thankful!! I love your group running adventures! What a fun run! You are lucky to have so many great running pals close by. 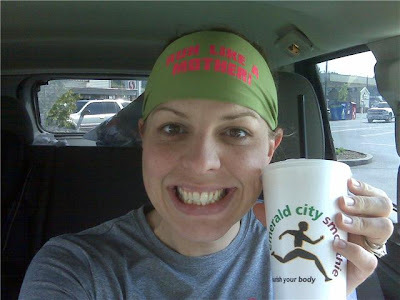 Wonderful bloggy run! 10/10/10 anniversary run sounds perfect. Chocolate milk post run = heaven. Was there a circus in town with all the big unicycles and bikes? You and Amanda are adorable you are going to have great marathons! Mmm...Smoothies. I put some strawberries in my freezer this AM to make smoothies with. Happy Tuesday! Yay for great running buddies!!! Sounds like a very interesting run you had! It looks like you had a wicked consistent pace on the solo 8-miler, way to go. Aw shucks, Mel! :) You're too sweet. Thanks! Awesome job on your run with Amanda! Miss you ladies! Very interesting sites on your run! You're doing so great with your training. You're gonna have a great marathon, and I'm sure you'll BQ. Have a good week! I agree that nothing tastes like chocolate milk after a run. I adore the picture of you and Amanda! Cute!!! Sounds like a circus brigade out there! Running buddies are the best. Yay for Zoe too, congrats. 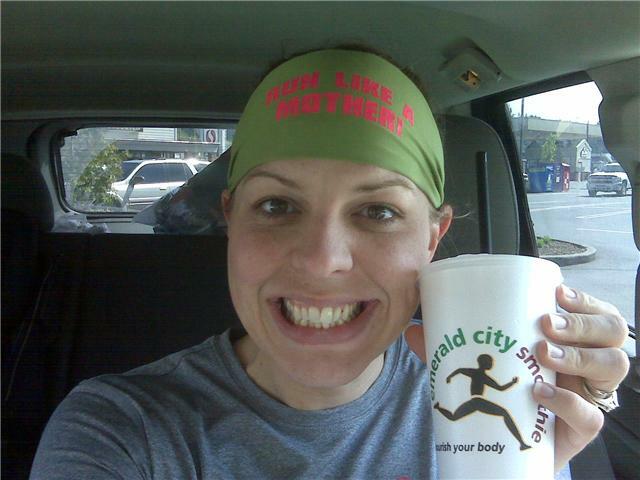 I just left a note on Amanda's blog - I'm running OKC but I'm probably a lot slower than she is. I'm running with the 4:30 pacer because she's one of my coaches. My PR is 4:42, so I'm hoping I can pull out a 4:30 this time. I hope she has a great race! Awe, just read this Mel! Thanks so much! i was def pround yesterday, i berely choked back the tears...I did it! And i proved to myself what I knew all along, I am strong and I can do ANYTHING! After yesterday I feel like everything else is simple, like i can just put my mind to it and do it! and I was thinking about Portland too!!!! i'll have to see where the calendar has me on 10/10/10...what? with a date like that I need to do something amazing!!! We'll chat about it!